Rabbit poo? Nope. 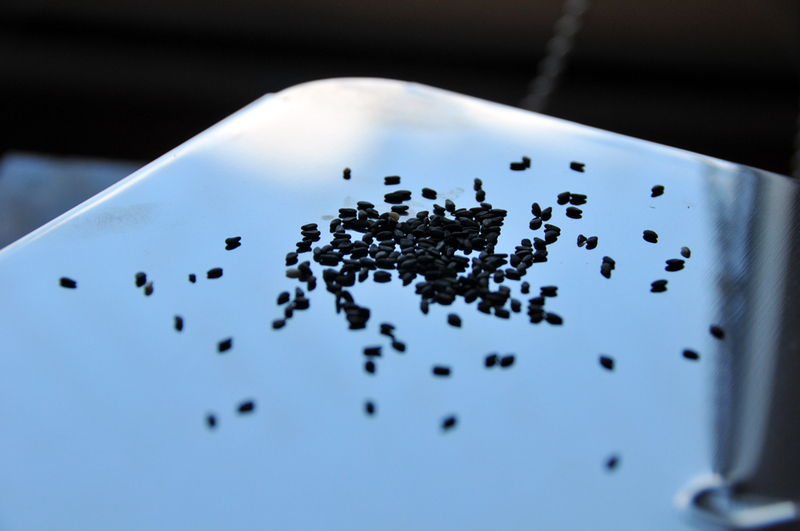 Black sesame seeds, which play a starring role in today’s recipe. This dish is adapted from Heidi Swanson’s recipe for Black Sesame Otsu from her upcoming book, Super Natural Everyday. If you haven’t visited her food blog (101 Cookbooks) before, go. She is one of my favorite healthy food recipe authors and I can’t wait to get my hands on her new book. This dish is everything you want in a Spring dinner–nice and light-tasting, not too heavy and packed with green leafy goodness. The only change I would make next time would be adding more cayenne. 2 big pinches just wasn’t enough for us. Now on to the goodness that is a bowl of Japanese noodles. Toast the walnuts in a dry pan over medium-high heat until they begin to release their aroma and are lightly toasted. Don’t forget to shake the pan regularly to avoid burnt spots. Add the sesame seeds and toast for only a minute or so, until they smell toasted. Be careful not to over-toast! Transfer the nuts to a mortar & pestle or bowl of a food processor. Crush until the mixture looks like black sand. Add the sugar, shoe, miring, sesame oil, vinegar and cayenne. Stir to combine and taste for seasoning. Wash and slice your chard into thin ribbons. When the water is boiling, add the soba and cook according to package directions until tender (about 3 minutes). In the last minute or so of cooking, add the chard and stir. When your noodles are tender and the chard is nicely cooked, drain, reserving about a cup of the cooking liquid. Rinse under cold water to stop the cooking. Reserve some of the sesame paste and the chives for a garnish. Scoop the rest into a large mixing bowl and thin with 1/3 c. of the reserved cooking liquid to form a sauce. Add everything else to the bowl and toss until combined. Serve topped with the reserved sesame paste and chives. Serves 2 for dinner, with enough left over for a nice lunch.